What Is DA Form 1380? DA Form 1380, Army Reserve Record of Individual Performance of Reserve Duty Training is a form required for all dental and medical-readiness period payments. A DA 1380 Form is prepared by the last day of each month to cover non-unit reserve training or equivalent duty performed by reservists assigned to U.S. Army Reserve (USAR) units other than Army extension courses or training performed with the unit of assignment. By the chief of the proponent agency for training projects. By a designated military representative for attending professional or trade convention meetings. By a reservist for training attachments with another service branch. In these cases, the form must be signed by the duly authorized official of the unit attachment. By the commanding officer of the unit of attachment for training in an attached status. By an official selected by the area commander for all other Reserve training. The DA Form 1380 - often confused with the DD Form 1380, Tactical Combat Casualty Care (TCCC) Card - was last revised by the Department of the Army (DA) in April 2016. An up-to-date fillable version can be downloaded below. How To Fill Out A Da Form 1380? How To Fill Out A Da Form 1380 For Ssd1? For use of this form see AR 140-185; the proponent agency is DCS, G-1. performed with the unit of assignment. a. For training projects - by the chief of the proponent agency for the project. b. For attendance at professional or trade convention meetings - by the designated military representative at the meeting. c. For training in an attached status - by the commanding officer of the unit of attachment. e. For all other Reserve training - as directed by the area commander. a. Items 1 through 3, 5 through 8, and 10 through 12, self-explanatory. b. Item 4 (TO:). Enter the complete designation and address of the record manager of the Soldier's records. duties, training or instruction performed. (1) Column a. Enter day, month, and year on which duty, training, or instruction was performed. (2) Column b. Enter the total number of hours covered by the form. For assigned training projects, see AR 140-1.
four hours of authorized training or instruction performed during one day. For assigned training projects, see AR 140-1.
assigned project over an extended period, also enter the inclusive dates of the period. Form 1380 is processed for pay and non-paid retirement points no later than the last day of each month. file one copy in the Soldier's AMHRR. Items 1 through 3, 5 through 8, and 10 through 12 are self-explanatory and contain basic information about the dates, names, and payments. Item 4 is for specifying the address you are sending the form to. Check the appropriate type of duty performed in Item 9. 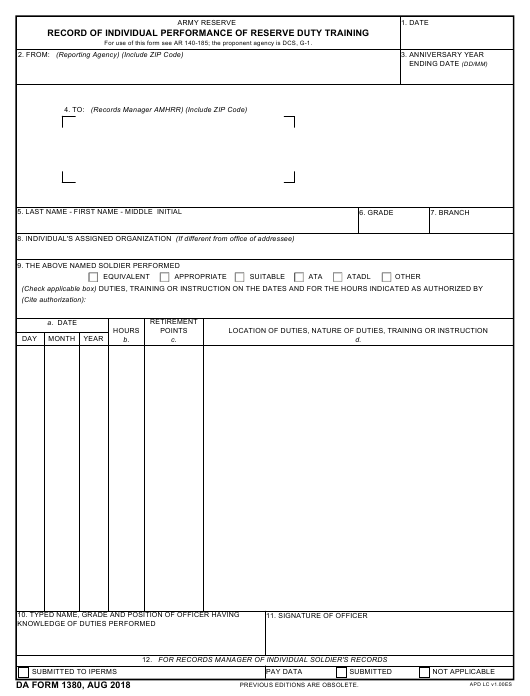 Enter the details of the training or instruction, the total number of hours, the number of earned retirement credits and a brief description of duties performed in Columns A through D.
Hand the form over to the custodian or your AMHRR who will then hand all paperwork to the authorized officer for signing. The Army Structured Self Development Level 1 course - commonly called the SSD1 - is a prerequisite course for soldiers looking to attend the Warrior Leader Course (WLC). Most Active Duty soldiers are expected to complete the SSD1 during duty hours or in their free time. Mark the box labeled OTHER in Item 9. Fill in the dates that you worked on the training in Column A. It's recommended to divide the training between ten different days. The SSD1 course is 80 hours long, but only 40 hours are listed on the form in Column B. Divide the required 40 hours between the ten days entered in Column A. Put P1 for each completed line in Column C.
Enter "Structured Self Development Level 1" for each completed line in Column D.
Send the completed form to the DA Human Resources Command at 1600 Spearhead Div Ave, Fort Knox, Kentucky 40122.